If you’re new to the world of flooring, knowing where to start can be a challenge. 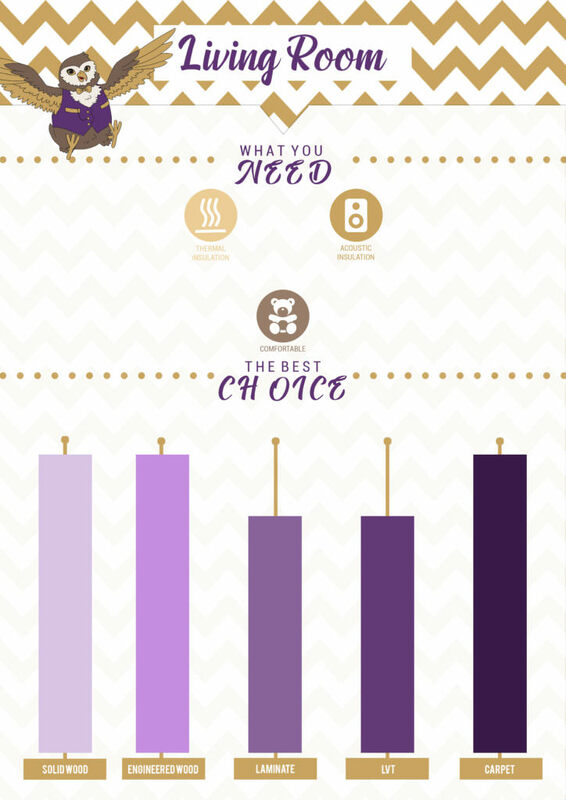 With a plethora of options available, it’s hard to tell which is the best choice for your home. Whilst some flooring materials may thrive in one environment, others will become damaged and need replacing, costing you more further down the line. Because installing new flooring is a hefty undertaking, it’s best to make sure you’re making the right decisions. Follow our quick and easy guide to flooring, and get a head start before renovating. The first thing to do is get to know your flooring. Whilst you may be familiar with the different types of flooring available, it’s hard to tell which material is best suited to which room. Every choice of flooring has its own set of characteristics, exhibiting an array of strengths and weaknesses that will determine where they should be installed. Durability: Simply put, this is how easily the flooring can withstand impact such as footfall. Flooring with higher durability will prove resilient against scratches, scuffs, and other damages. Lifespan: This refers to how long the material will last before it needs to be replaced. Low Maintenance: Some flooring requires more work than others to keep clean and free from harm. Lower maintenance flooring requires less attention. Humidity and Moisture Resistance: How well the flooring fairs against fluctuating temperatures and water presence. Materials with a greater tolerance won’t be easily damaged. Cost: The price of the flooring. It’s important to note that attributes such as appearance and feel have been purposefully avoided, as this is a matter of personal preference. Furthermore, as materials tend to vary in quality, the value given should be treated as a basic outline. For more specific information, make sure to check the manufacturer’s details. Solid wood is without a doubt one of the most desirable flooring materials on the market. For generations, hardwoods such as oak and walnut have been relied upon for their high wear resistance and structural stability. If treated correctly, solid wood flooring can last an entire lifetime, and will not require sanding for at least 10-15 years. However, solid wood is often prone to warping and shrinkages in the presence of moisture and high humidity, so you must take additional care to prevent damages. Whilst prices do vary, they are renowned for being steep in comparison to other alternatives. However, the cost is generally representative of high quality, and solid wood flooring can actually increase the value of your property further down the line. This is a contemporary take on traditional hardwood flooring. Engineered boards are composed of two main parts: a solid wood lamella, and a core of compressed timber. This core prevents movement within the board, allowing for greater resistance to humidity and moisture. Whilst the solid wood surface tackles heavy footfall with ease, engineered boards are arguably less durable than hardwood flooring. This is because layers can delaminate under stress, and sanding cannot be completed as frequently. Engineered flooring is, however, marginally cheaper than solid wood, and boasts a similar lifespan. 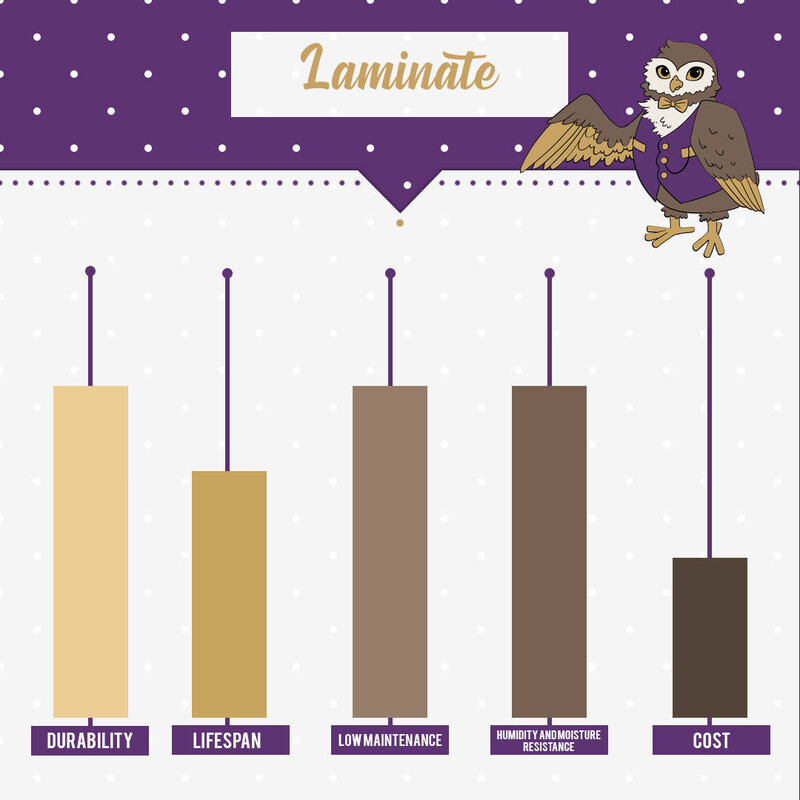 Laminate is a popular alternative to solid and engineered wood due to its low cost. Constructed primarily from synthetic materials, laminate flooring is moderately water resistant, and can be installed above underfloor heating. Although laminate is resilient to scuffs, scratches, and spillages, it only has an average lifespan of around 10-15 years. However, at such a low cost, laminate flooring excels in accessibility. Laminate floors are also easy to clean, requiring little maintenance and work once installed. Luxury vinyl tiles are a new addition to the world of flooring, but are fast becoming a favourite. Constructed from high quality PVC, each tile proves highly durable, and is 100% waterproof. Tiles are finished with a polyurethane coating for scratch and slip resistance, and can be cleaned with a quick sweep or mop. Whilst LVT imitates natural textures more realistically than laminate, tiles often come with a larger price-tag. 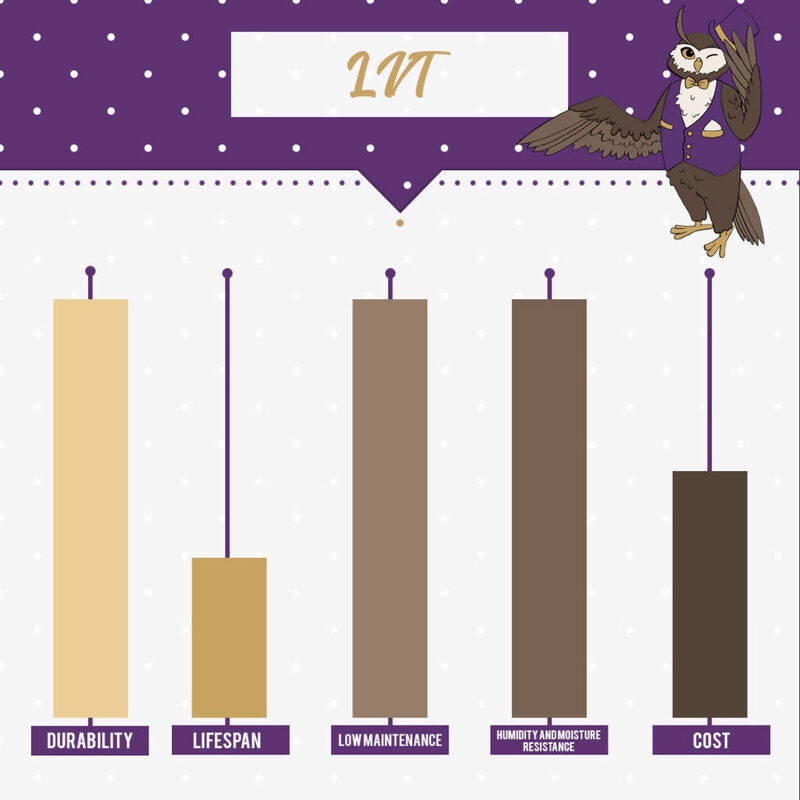 LVT also has a shorter lifespan, averaging 10 years in total. Carpet adds a touch of comfort and luxury to any style of home. Whilst durability will vary depending on the fabric and pile, most carpets are specially treated for stain resistance. Light vacuuming proves sufficient when pacifying dirt and debris, and will help to prevent pile crush. Carpets are highly resistant to fluctuations in humidity, however, excess moisture runs the risk of deteriorating the fabric. 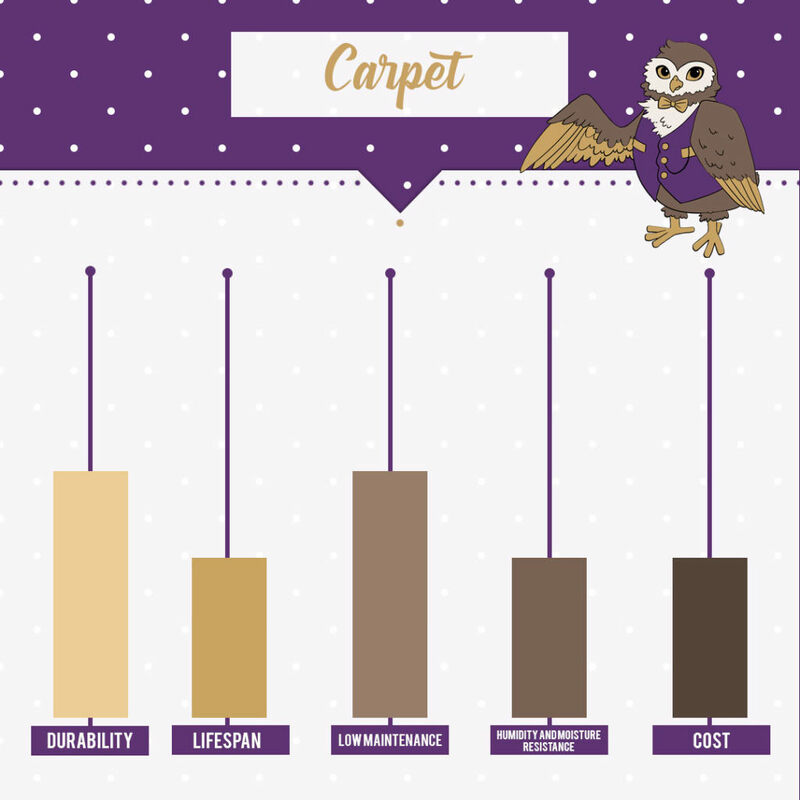 Carpet lifespan is relatively low, but far cheaper than real wood and LVT. The next section of this guide to flooring will assess which types of materials are suitable for the main areas of your home. As mentioned above, some materials will have disastrous effects if placed in the wrong environments. This could cost you a fortune in repairs and amendments further down the line. Typically, homeowners will renovate their flooring one room at a time. 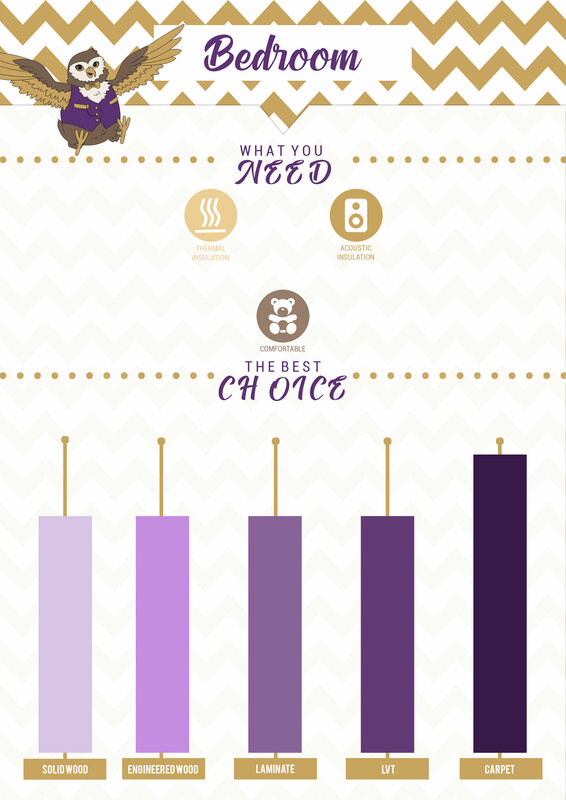 As a result, we’ve constructed this guide to look at each room individually. Whilst many consider the kitchen to be the heart of the home, it's one of the most hostile environments for your flooring. Not only are kitchens one of the highest traffic areas in your home, splashes, spills, and food debris are in higher abundance. 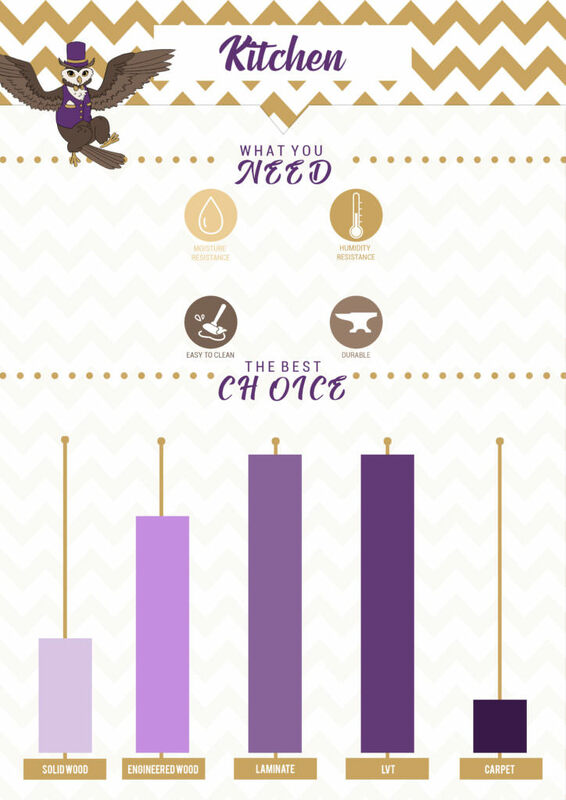 Additionally, temperatures tend to fluctuate greatly, especially near stoves and other cooking appliances. Consequently, carpets and solid wood flooring are not recommended. Carpet pile will begin to rot, and the structural integrity of real wood boards will be compromised by the humidity and moisture content of the room. Although this is the case, some older homes may have hardwood already installed. Whilst warping and shrinkages are likely to occur over time, solid wood can provide some desirable results, but are a poor choice in comparison to engineered wood, laminate, and LVT. Engineered flooring is a great choice for kitchens. Not only has it been designed to withstand more extreme conditions, it is also easy to clean, and will not trap unpleasant smells. Engineered boards are highly durable, however, any moisture that comes into contact with the surface must be dried immediately, making them higher maintenance. Laminate and LVT are the safest options for kitchens, delivering excellent resilience against stains, scuffs, and scratches. The living room is one of the most versatile spaces for flooring. Ultimately, choosing living room flooring is down to personal preference, however, there are a few things to bear in mind. 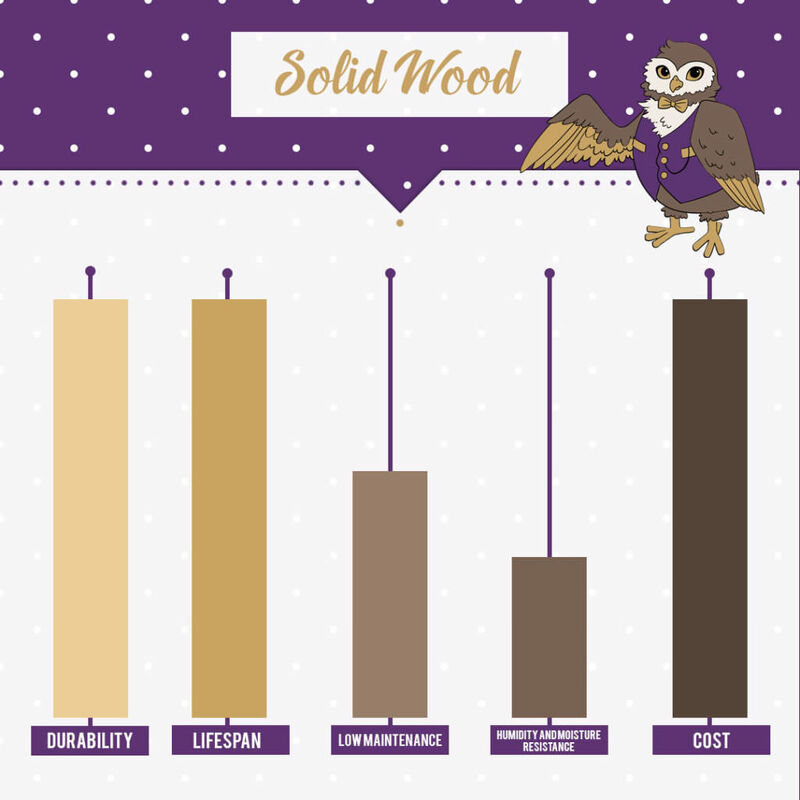 Solid wood is not recommended if your living room has underfloor heating or a log burning stove. Some may also prefer materials that boast higher levels of thermal and acoustic insulation, allowing for more cosiness and less disturbances. As a result, laminate and LVT may be less desirable, but can deliver great results if installed. 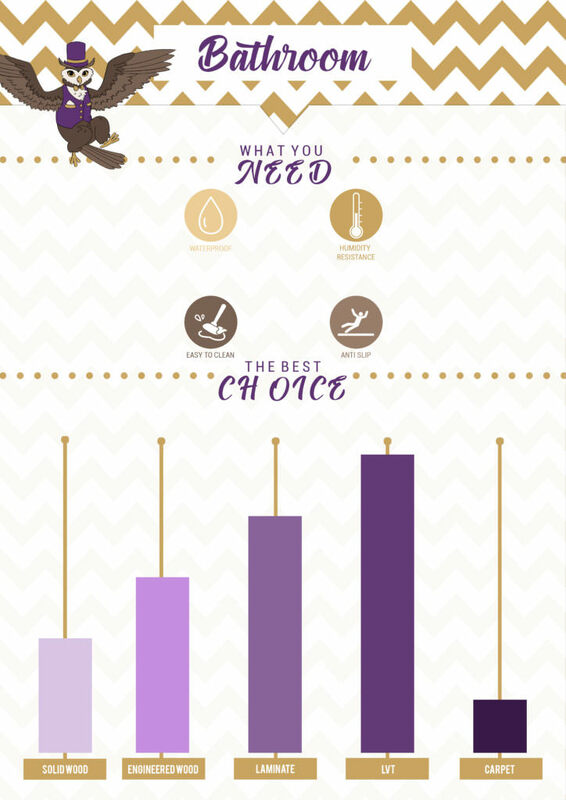 Bathrooms have the highest moisture content of any room in the house. This comes in the form of both spillages and steam from hot water. As a result, carpet and solid wood are completely unsuitable. 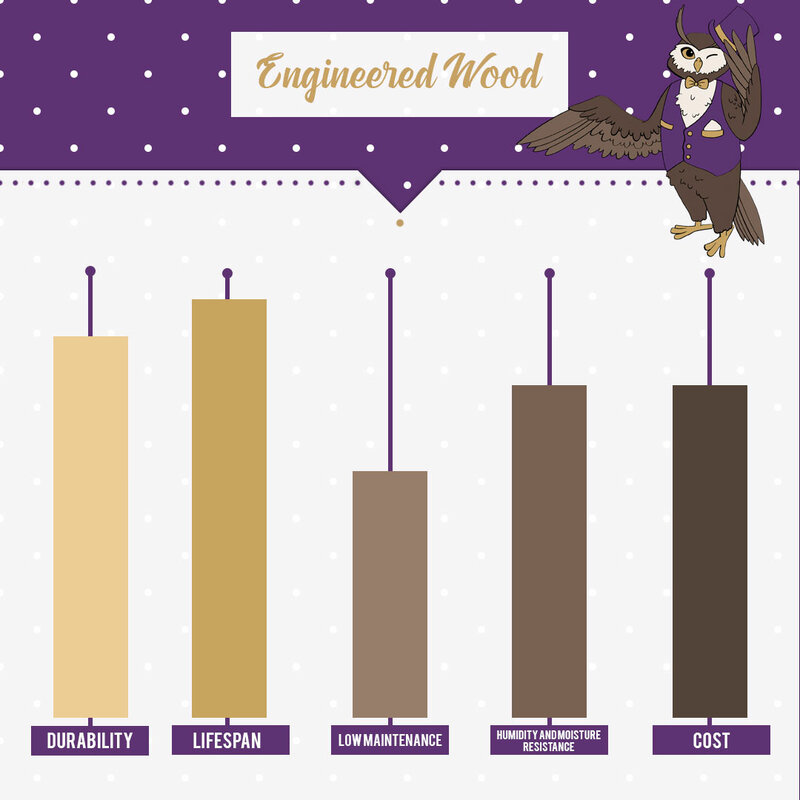 Engineered wood is also not recommended, however, it will fare much better than its solid wood counterpart. Laminate is a great choice for bathrooms, and is one of the most popular options next to tiles. However, laminate is only moisture resistant, and may become waterlogged if the right care is not taken. For optimal results, you should install LVT flooring. Not only are luxury vinyl tiles 100% waterproof, their polyurethane coating boasts impressive anti-slip properties, and make the tile the easiest flooring material to clean. Much like in living spaces, bedroom flooring is hard to get wrong. As footfall is low, the durability and wear resistance of your flooring is less important, making any choice suitable. 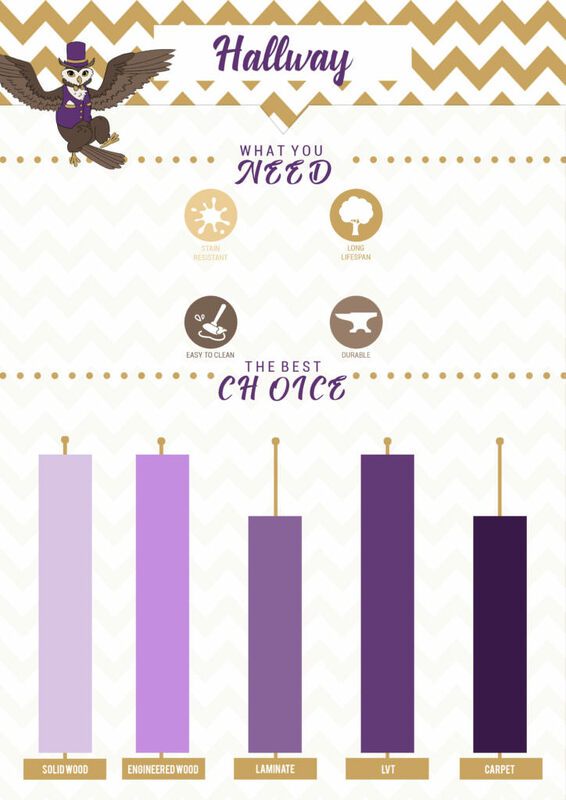 However, statistics have shown that carpet is the most popular bedroom flooring choice amongst homeowners. For enhanced comfort, materials with thermal and acoustic insulation properties should be chosen. This will help to protect you from any unwanted noise, and will prevent sleepless nights. If you're not a fan of fabric, solid and engineered woods are your next best choice. Wood conducts and circulates heat around your home, allowing for a consistently higher temperature once the heating is on. LVT and laminate may prove too cold for some homeowners, but still have many attractive benefits. Hallways are often the first point of contact you have with your home, so it's important to get them looking and feeling their best. Acting as the passageway between rooms, hallways tackle the most daily foot traffic. As a result, hallway flooring must be extra durable. Additionally, hallways near the entrance of your home are more likely to take on outdoor debris, such as soil and other residue that's found on the underside of shoes. Whilst any of our flooring choices are suitable, solid, engineered, and LVT flooring reign supreme in this setting. All three are easy to maintain, and will resist surface wear with ease. However, it's important to note that LVT has a shorter lifespan, so will need reinstalling quicker than other materials. Carpet and laminate flooring are also great choices, but may exhibit some drawbacks. Although many carpets are treated for enhanced stain and soil retardance, carpet pile may still absorb some dirt and grime after over exposure. Laminate can handle foot traffic effectively, but is sometimes less desirable due to its appearance. This, however, is down to personal preference. Want to give us your own flooring tips and advice? Don't hesitate to get in touch! Find us on Facebook, Twitter, and Instagram for more news, blog posts, and great content. Join the discussion today, and leave your comment below!